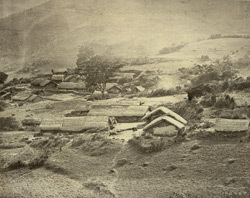 Photograph of the Kota village at Padugula, near Sholur in the Nilgiri Hills in Tamil Nadu, taken by an unknown photographer from the Madras School of Arts in c. 1871-72. This photograph forms Plate XXI of James Wilkinson Breeks 'An Account of the Primitive Tribes and Monuments of the Nilgiris' (India Museum, London, 1873). Breeks was the Commissioner of the Nilgiris and wished to make a record of the indigenous hill-tribes of the region before their way of life, customs and legends died out due to increasing western influences. The Kotas live in large communities, each village containing anywhere from 30 to 60 huts that are built with mud walls and covered with thatch grass. The floors of the hut are raised 2 to 3 feet above the soil and a a short verandah is built in front. The pillars of some of their verandahs are made of stone and are sculptured by experienced stone cutters.